The Bionic Bar has almost become synonymous with the ships of Royal Caribbean’s Quantum Class – with competitors even taking note and trying to downplay their attraction in advertising campaigns. The intelligent, automated cocktail-mixing robots are one of the key features which have seen the Anthem of the Seas and sister ship, Quantum of the Seas, named as the world’s first smartships. With the capacity to mix up cocktails from a list so comprehensive, even Tom Cruise would struggle to remember all the secret ingredients – the robotic bartenders can accurately and quickly create delicious cocktails for all guests (above the age of 21) aboard the Anthem of the Seas. How Do I Order at a Robotic Bar? Rather than barking orders over other barflies and the music, the Bionic Bar also offers guests the opportunity to order drinks via a Windows tablet. This simple, automated ordering process reduces mistakes and improves the speed with which you’ll receive your drink. The simple push-button menus also means you won’t be expected to learn Morse code to communicate with the robotic bartenders. The Bionic Bar benefits from two single-arm robots, capable of mixing separate drinks at the same time. Crushing lime, measuring spirits and stocking up on ice are just a selection of the essential cocktail jobs the robots are capable of completing. Gratuities are still added onto the bills for cocktails but these will go towards the human staff who offer their assistance to their robotic colleagues. Although the robotic bartenders are the undoubted stars of the Bionic Bar, their human friends are still vital cogs in the machine. 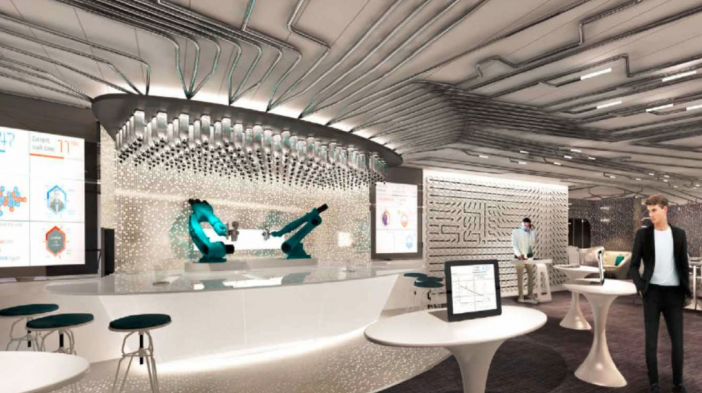 The Bionic Bar has almost become synonymous with the ships of Royal Caribbean’s Quantum Class.